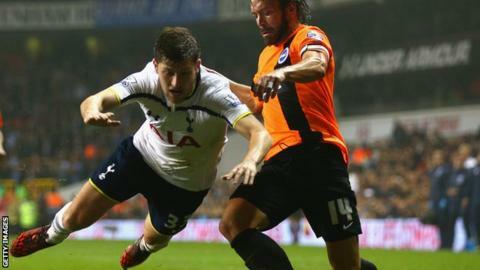 Wales full-back Ben Davies admits he is "frustrated" by his lack of Premier League starts since joining Tottenham from Swansea in the summer. The 21-year-old has played seven times for Spurs, but only one of those appearances was in the top flight. Davies told Sport Wales he is determined to make the grade. "It's frustrating at times. But coming here I was taking nothing for granted that I was going to walk straight into the first team," he said. "I have to bide my time, take my chances and work hard, as I do every day. "And when that chance arises to get the games in the Premier League, then I've got to be ready for that and take it with both hands." Davies's only league appearance under Mauricio Pochettino came as a 72nd-minute substitute for Danny Rose against Liverpool, who were already 3-0 up. But he has started four Europa League matches, and the League Cup ties against Nottingham Forest and Brighton. He was also in the Wales side for their Euro 2016 qualifiers against Andorra and Bosnia-Hercegovina. "I feel like I'm improving as a player every time I get the chance to get out there," said Davies. "It's sometimes difficult not playing as many games as I'd like maybe in the Premier League, but that's part and parcel of it all." Davies made his debut for Swansea as a 19-year-old in August 2012 and quickly established himself as first-choice left-back when Neil Taylor suffered a long-term injury. He joined Spurs on a five-year contract in July and says he would not currently consider the possibility of returning to the Swans on loan. "I'm 100% focused here at the moment and I haven't really thought that far ahead," he said. "I think it would be silly of me to put that idea into my head right now. "I've got to prove to everyone here, and to myself really, that I can do a job at this club and that is what I want to do. "I want to push on as far as I can and be as successful as I can at Spurs." You can see more of the interview with Ben Davies on Sport Wales on BBC Two Wales on Friday, 7 November at 19:00 GMT and on the BBC iPlayer.